The story of Music & Dance Academy dates back to 1992, when Nina Tishkevich, together with her family arrived in Tucson, Arizona from Tashkent, Uzbekistan. In Russia, Tishkevich was the director of the music curriculum for more than 30 schools in Tashkent. She holds master’s degrees in piano performance and musicology and she completed her doctoral dissertation on piano pedagogy. Instead of sitting around and complaining about her exile status, she instead decided to rebuild her life around her life’s passion and career work, by playing and teaching music. In 1995, Tishkevich founded Music Academy of Tucson, where she envisioned to create an environment where students can experience camaraderie and develop musicianship by playing together in ensembles as well as individual lessons. The academy follows the Suzuki method in its approach to music instruction. The Suzuki method, developed by Japanese classical violinist Shinichi Suzuki, follows the philosophy that people can develop any type of talent if put in the right environment. The academy also encourages the involvement of parents in their children’s learning process. 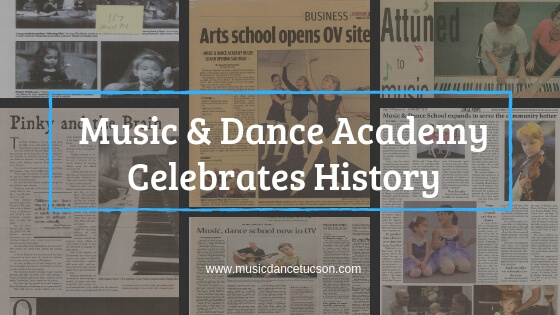 After 12 years, Music & Dance Academy opened a new school in Oro Valley. Following in 2010, it has expanded into Catalina Foothills to serve the community better. Over the years, Music & Dance Academy has been participating in many enriching events. One of which is the “Magic Carpet Concert series” which built a way to introduce different cultures, composers, music and dance to the children in an interactive way. For its 10 th year anniversary, the academy celebrated with a free performance at the University of Arizona’s Crowder Hall with the theme, “Celebrating Music for Life”. Last 2016, the Music & Dance Academy celebrated its 20 th year anniversary with a no-holds-barred gala event, complete with a red carpet. In 2004 the academy has held “Performathon” which was musical marathon participated by the students aiming to raise money for the Reaching for Excellence scholarship fund which benefits students who otherwise may not be able to afford musical education. Today, the academy works with Tucson and Oro Valley arts organizations to bring educational and enrichment opportunities to its students and the community at large. Aside from the academy’s excellent music and dance programs for students of all ages, the academy had also developed special classes, courses and programs to serve the community better.  Kindermusik Village is a music appreciation class for infants to toddlers.  Behind the Music lecture series centered on Tucson Symphony Orchestra (TSO) series of concerts.  The academy has developed a special program for seniorsincorporating dance and music.  The STAR Leadership program is a youth leadership training course designed for organizations, schools, clubs or studios passionate about growing young leaders.